Wasabi is used as a condiment for Japanese dishes such as sushi, sashimi and soba. 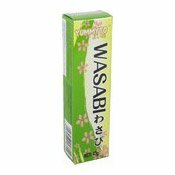 For sushi and sashimi, wasabi paste is mixed with soy sauce. For soba noodles, wasabi paste is added to the broth for seasoning. Simply enter your details below and we will send you an e-mail when “Wasabi Paste (芥辣醬)” is back in stock!